For many buyers, it can be confusing trying to select among different types of cookware. Both stainless steel and enamel pans are non-stick and durable, yet each offers its own distinct features and benefits for cooks. When comparing these two materials, consider things like cost, durability, safety and your intended use to help you make your selection. Stainless steel pans are made from a blend of iron and chromium. While other varieties of stainless steel contain around 11 percent chromium, cookware made from this material may contain 20 percent chromium or higher. Many also have a copper or aluminum base to help with heat distribution. Enamel pans are made from a cast iron or steel base, then coated with porcelain enamel to give the pan a smooth non-stick surface. The porcelain coating is made from natural clay that has been baked and glazed to make it very hard and durable. Enamel pans combine the heat distribution benefits of iron with the non-stick properties of enamel. Foods will cook evenly and the taste will not be affected by interactions with the materials in the pan. Stainless steel pans are highly resistant to rust, corrosion and interactions with acidic foods. They can withstand very high levels of heat without damage and are resistant to scratches or other surface damage. The finish on a stainless steel pan is also considered highly attractive by many buyers, and can be used to complement the decor of the kitchen. Stainless steel is a poor conductor of heat, and foods tend to cook unevenly. For best results, food should be moved around the pan while cooking, which can be time-consuming. These pans also have a high nickel content, which can bother people who are allergic to nickel. 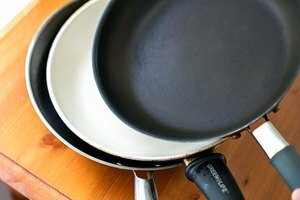 Enamel pans with an iron base can be extremely heavy and tend to take a long time to heat up. Those with a steel base are more expensive, though they heat up more quickly. All enamel-coated pans are subject to scratching or chipping, which can reduce the function and visual appeal of the pan. 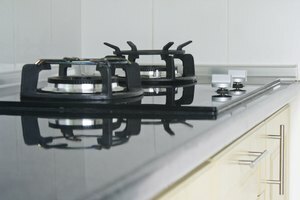 When choosing a pan, consider how it will be used in order to determine the best material for the job. 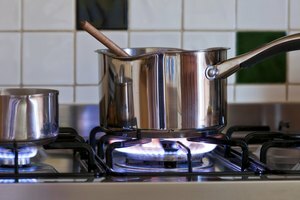 Enamel pans with a steel base do not distribute heat very evenly, but are a good choice for boiling water. Enamel pans with a cast iron base are useful for all types of cooking, though the iron may make larger pans too heavy for some users. Stainless steel is an effective choice for baking, as the uneven heat distribution doesn't matter as much in the oven as it does on the stove. Stainless steel pans are generally much more expensive than enamel units. This added cost may be worth it if you plan to display your pans as part of the decor, or hang them above the countertop. Enamel over steel is a mid-range price option, while enamel over cast iron is the most affordable of these three pans.